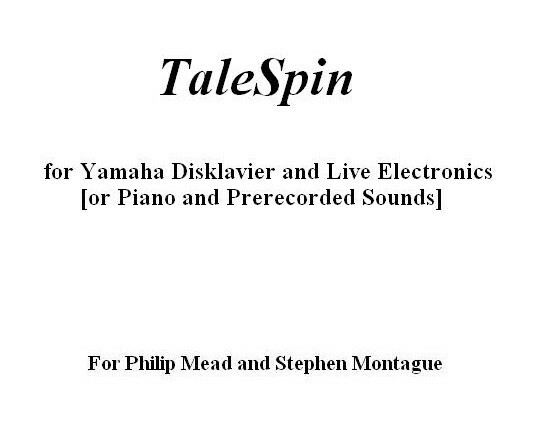 TaleSpin was commissioned by the Montague/Mead Duo (Philip Mead, Piano & Stephen Montague, Electronics). It is a short musical fantasy, written in a quasi-romantic style. It has something of a program, too, whose subject may be evident from some of the section titles: Telltale, Hot Topic, Blissful Ignorance, Morning After Songs, Still Spinning, and Picking up the Pieces. Many of the electronic sounds are processed sounds recorded inside the piano, included stopped and bowed notes, plucked and struck notes, prepared notes, etc. In the outer fast sections, it is similar to a piano 4 hands piece, with the computer responsible for the middle two “hands.” The computer part is relatively simple and accompanimental, however, while that played by the performer – the outer two hands – is soloistic and quite virtuosic. Included on the CD Music from SEAMUS volume 10, as performed by Gregory Allen. Also recorded by Jade Simmons and included on her CD Revolutionary Rhythm, on the E1 Music label (KIC-CD-7760).